With Nintendo Switch, fans can enjoy the definitive version of Mario Kart 8 anywhere, anytime, even with up to 8 friends in local wireless multiplayer. 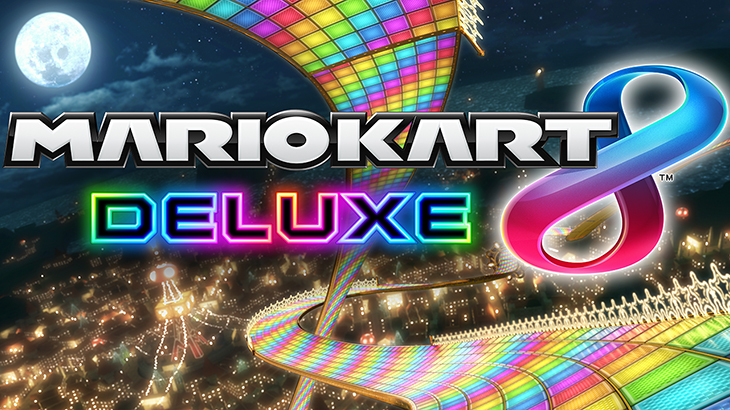 It’s the biggest Mario Kart ever! 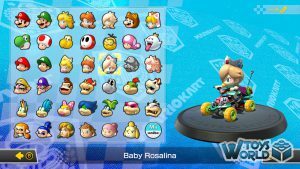 All your favourite tracks and characters return from the Wii U version but you’ll also find all DLC tracks and characters, as well as all-new characters too. 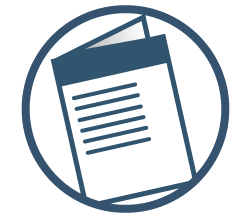 Plus, Battle Mode has been completely revamped! 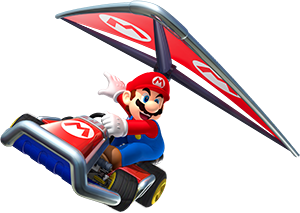 Mario Kart has been a defining racer since its original release in 1992. 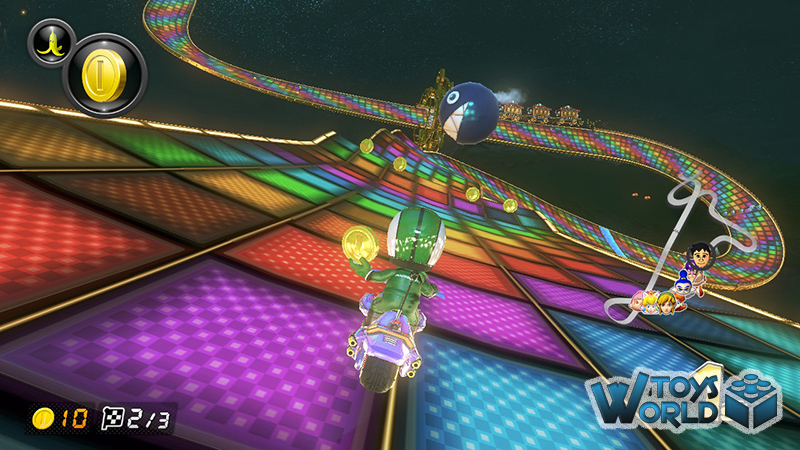 Combining fun with skill and those all-important power-ups, the game has sold well over 100 million copies, worldwide. 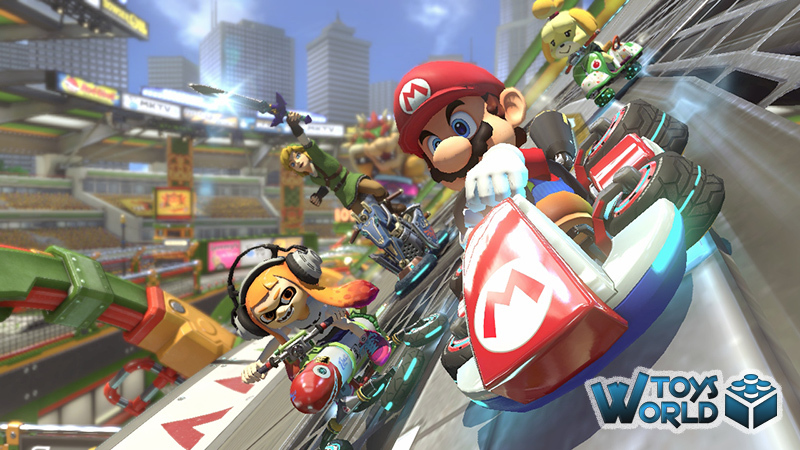 It was the release of Mario Kart Wii, however, that redefined the game, allowing (for the first time on a full console) the ability to connect online and race with players across the world. 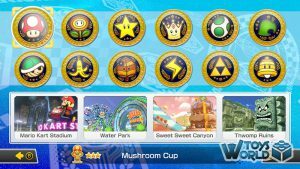 If you manage to complete all the cups in 200cc mode, you will also get to unlock a special secret ‘Gold Mario (Heavy)’ character. Balloon Battle – each player starts off with 5 balloons, which other players have to pop. Bob-omb Blast – similar to balloon battle, except the only items that players can find are Bob-ombs. Renegade Roundup – players are split up into 2 teams, in a cops and robbers style pursuit. 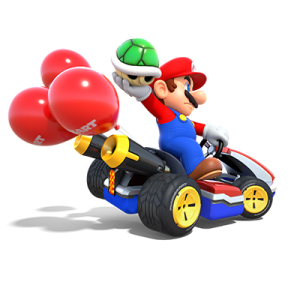 One group have piranha plants attached to the front of their vehicles and must capture players in the opposing group. 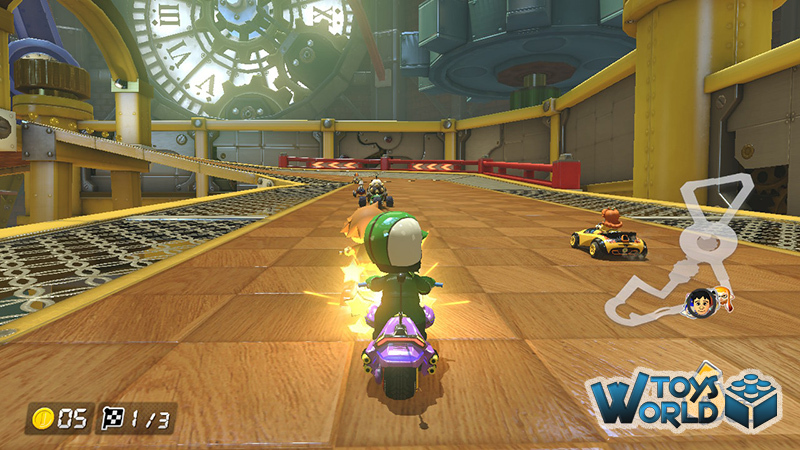 Coin Runners – players must battle to claim the most coins in the arena before the timer runs out. Shine Thief – players have to battle over the control of a shine sprite in the style of capture the flag. 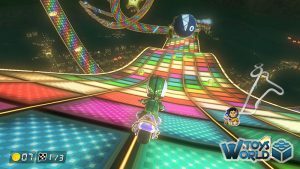 Other changes for the Nintendo Switch version of Mario Kart 8 Deluxe, include being able to play in 1080p resolution (compared to 720p on the Wii U), with 720p resolution in handheld mode. 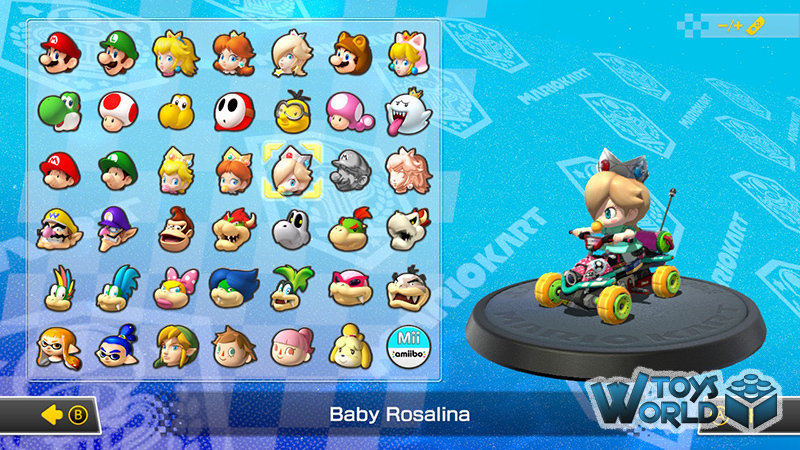 There are also updated Mii animations, as well as new menu graphics. So that’s everything new compared to the standard Mario Kart 8 version, but how about the gameplay itself? 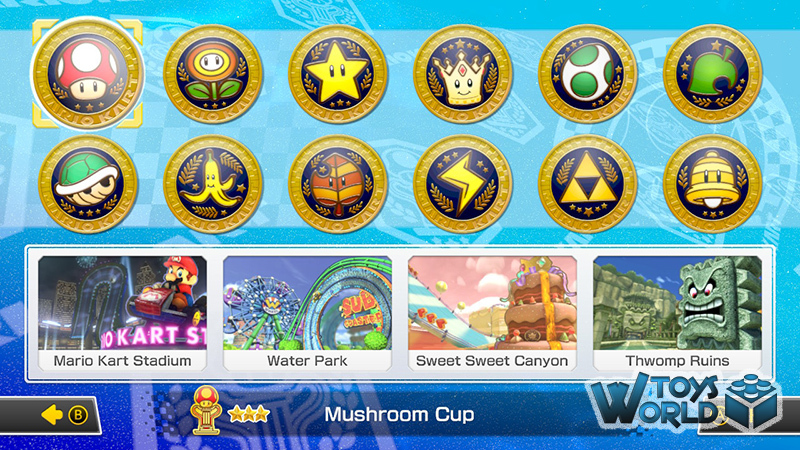 Any of you familiar with Mario Kart Wii, will feel right at home with the latest iteration. 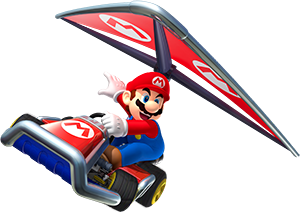 Rather than rebuilding the game from the ground up, Nintendo have taken the success of the Wii version, and improved on it immensely, whilst retaining the spirit and barebones of its predecessor. 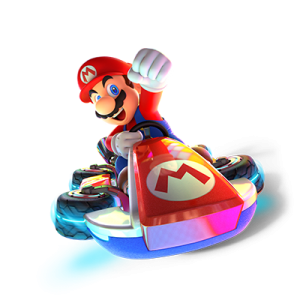 One major improvement is the graphics, and being able to play Mario Kart in high definition really does make a huge difference to the overall enjoyment and immersive feel of the game. There are some lovely little in-game, on-screen FX, like water when it’s raining. The raindrops hit the screen in an incredibly realistic style that makes you second guess whether you need to rub the screen dry or not. 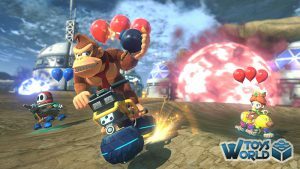 The Nintendo Switch brings with it the fantastic ability to play on your TV, but also in handheld mode on the go, and this is where Mario Kart 8 Deluxe really comes into its own. The ability to take the game with you in the car and race while you’re literally on the road (with a responsible driver in charge of the actual car, of course), is truly fantastic! Online multiplayer mode is as entertaining as ever, and you really feel like you need to up your game to compete with other players from around the world. For the first time you can also bring a second local player online with you for two-player, online mode. The previously mentioned battle modes really take the game up a notch too, and add a welcomed change to the gameplay if you fancy switching things up a bit. One of our favourite modes was Renegade Roundup, where you have to try and catch (or evade) the opposing team members with your piranha plant. 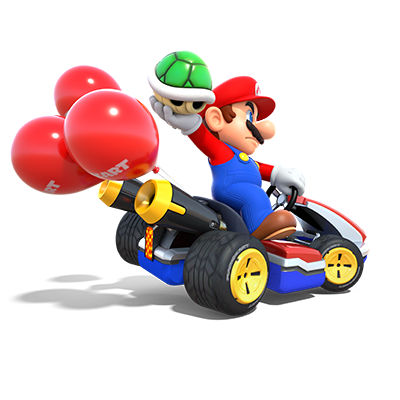 We cannot find fault in Mario Kart 8 Deluxe (except for that annoying thing where you’re in 1st place and know that the blue turtle shell is coming for you any second), everything we loved about the previous version has been improved, and with tracks that revisit some old favourites, you get a double hit of nostalgia with the game. 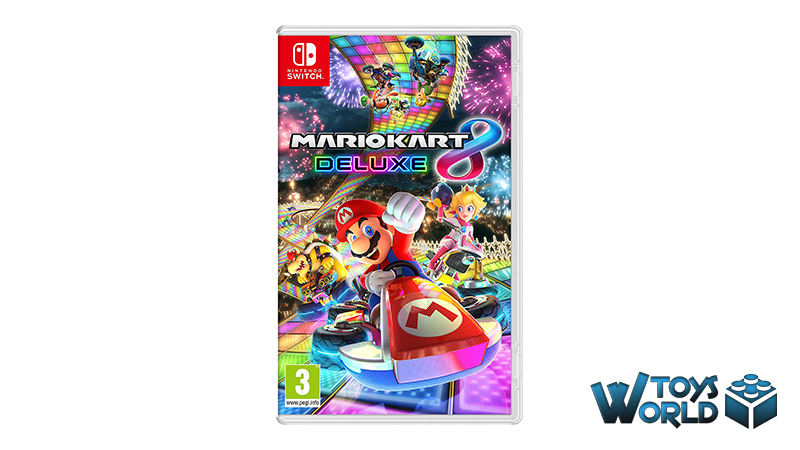 ToysWorld are thrilled to give Mario Kart 8 Deluxe our second ever Gold 5-Star rating! + BUY Mario Kart 8 Deluxe from Amazon.co.uk from just £41.99! + BUY Mario Kart 8 Deluxe from Amazon.com from just $59.88! 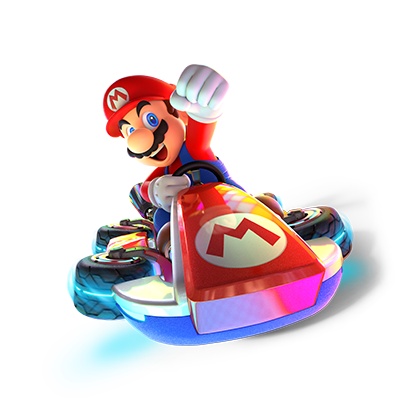 Video Games & Consoles Computer Game, Kart, Mario Kart, Mario Kart 8, Mario Kart 8 Deluxe, Nintendo, Nintendo Switch, Racer, Racing, Switch, Video Game, Video Games. permalink.